The days of mechanical buttons are limited as we dive further and further into the capacitive touch era. In fact, capacitive touch technology, which relies on the electric properties of our light touches, flicks, and scrolls to perform key actions, is so common today that we probably take it for granted. From products like our mobile devices and watches to retail kiosks, thermostats and security systems, capacitive touch is just another part of our everyday lives. While capacitive touch has been around for years, we are always looking for ways to take the technology to the next level with our lighting solutions. 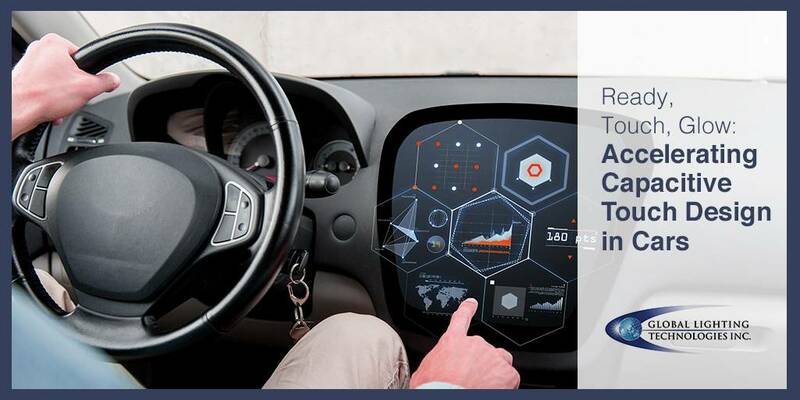 There’s plenty of opportunities to improve their performance within certain environments, especially automotive vehicles where safety and communication are critical. You’ve probably seen capacitive touch incorporated into some cars’ center consoles to control HVAC, navigation and radio functions, but its use is not as prevalent as in other industries. Why? Long design cycles are one reason for the slow adoption. There have also been concerns that drivers rely on the feeling of pushing buttons to understand whether or not an action has occurred. Initial touch sensors on the market yielded minimal tactile feedback, requiring users to divert their attention and wait for screens to visually change to know if their interactions were successful. As more and more automakers implement capacitive touch, Global Lighting Technologies has enhanced our light guide technology to feature improved sensory feedback. Illumination triggers – A light guide within a capacitive touch overlay’s assembly allows for illumination of icons, text, logos and graphics. These elements light up when touched, thereby allowing the user to recognize that an action has been detected. This is especially critical for people driving at night. Ultra-thin components – Conventional buttons are illuminated by placing LEDs directly below the button. Capacitive touch technology requires a more nuanced solution. The touch sensors must be located directly underneath the icons on the overlay for effective illumination. Fortunately, our ultra-thin edge-lit light guides (as thin as 0.2mm) can be placed between the overlay and the touch sensor, enhancing the device’s detection capabilities. Enhanced system efficiency – Our light guides enable manufacturers to use fewer high-efficiency LEDs to achieve the desired illumination. This reduces production and assembly costs, while also decreasing the device’s overall power consumption. Capacitive touch design and sensory feedback need to be intuitive and reliable to deliver maximum impact within automotive vehicles. In addition to delivering improved color, uniformity and efficiency, our light guide technology allows users to complete tasks faster and safer, making the in-car experience even better. When you need a custom lighting solution or help taking on a new challenge, contact our lighting experts.